The Rain-forest Protectors in Sri Lanka, requested the relevant authorities to take immediate and corrective steps to stop the destruction which is taking place due to the rapidly spreading mini-hydro projects throughout the wet zone. They also urged that the national policy on renewable energy be focused on technologies that do not cause ecological destruction to vital catchment areas. 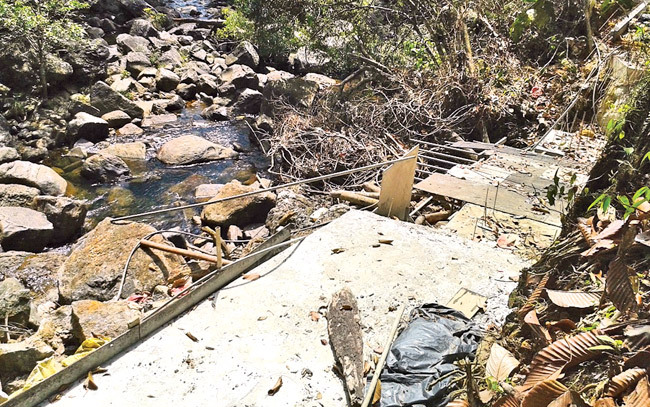 According to the Rain-forest Protectors, the Anda Dola, a tributary of the Gin Ganga in the Neluwa Divisional Secretariat in Galle district had become the latest victim of the above threat as constructions of the Anda Dola Mini-hydro Project was now going on. Accordingly, the weir and 2.5 km section of the concrete channel had been constructed within the Dellawa Rain forest which is ecologically a part of the Sinharaja Rain-forest Complex. Due to constructions which is going on within the protected forest reserve and the negligence on the part of the developer, the project is causing massive environmental destruction affecting the stream, the rain-forest, soil and endemic fish in the region. In addition, the mini-hydro project would destroy a total of 6.5 kilometer stretch of the Anda Dola, as water was being diverted off from the weir to the powerhouse several kilometers away. As a result, many endemic and endangered fish species recorded in the Anda Dola would be extincted. Many endemic and endangered trees have also been cut down during construction at the weir and along the concrete channel to the powerhouse within the protected forest reserve. Many of these endemic trees in the region are listed in the IUCN red-list of endangered species and in danger of extinct. The project site had already experienced severe soil erosion and earth slips due to the removal of these large rain-forest trees, they stated. Further, a massive trench dug through a hill has jeopardized the stability of the soil mass which may soon result in a severe landslide. While the project developer had submitted an Initial Environmental Assessment (IEE) report to the authorities, an unbiased Environmental Impact Assessment (EIA) with a public comment period had not been carried out although construction is taking place within a protected forest reserve. Therefore, approval given to this project by the Forest Conservation Department is questionable, they further explained. Why the Sustainable Energy Authority and Ministry of Power and Energy are continuing to push destructive mini-hydro projects within protected rain-forest reserves, instead of promoting environmentally friendly and drought tolerant alternatives such as rooftop solar, waste to energy and offshore wind, Rain-forest Protectors questioned.